Satellite TV Nicaragua is a young but very motivated satellite tv/ internet installation services company founded by Alberto Araya, a computer engineer and a professional satellite enthusiast that saw an opportunity to provide high quality U.S. / English Speaking TV programming in Nicaragua at a fair price. Below, you will find 4 ways that we can “enable” your big screen TV to play U.S. TV programming from Nicaragua. 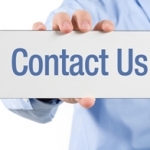 We have products and services to accommodate all types of budgets. 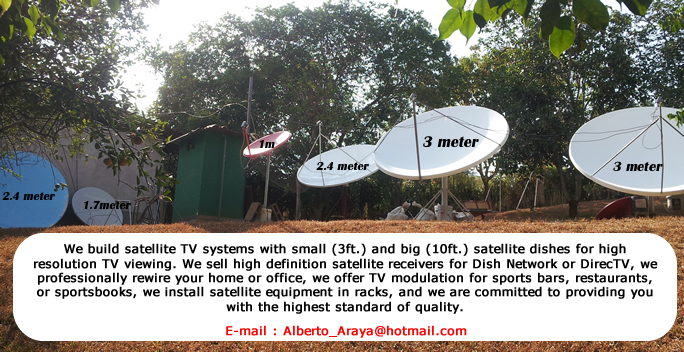 We build satellite TV systems with small (3ft.) and big (8ft.) satellite dishes for high resolution TV viewing. We sell high definition satellite receivers for Dish Network or DirecTV, we professionally rewire your home or office, we offer TV modulation for sports bars, restaurants, or sportsbooks, we install satellite equipment in racks, and we are committed to providing you with the highest standard of quality. Please keep in mind that all 4 services described below, are Satellite TV services offered by American Multinational Corporations. This is not TV Streaming, Internet TV or IPTV that does not work right from Latin America because of Internet bandwidth limitations. 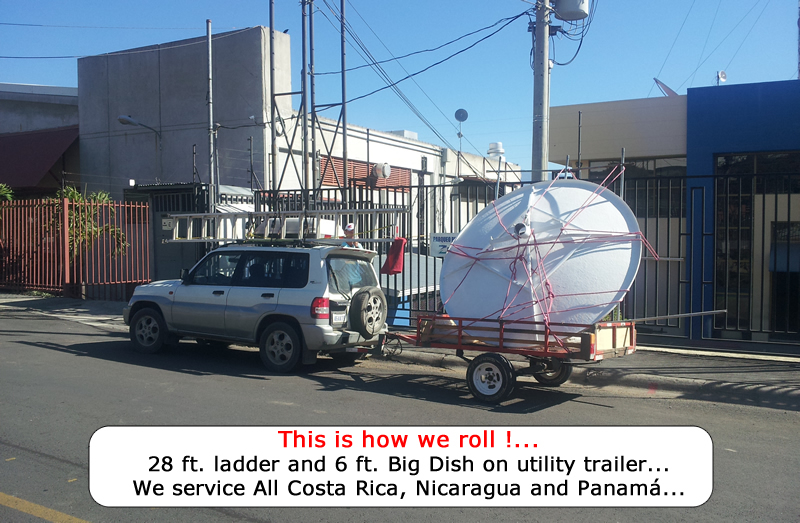 This is also NOT pirate Satellite TV with chinese satellite receivers and IKS servers which are pretty popular with “local/ nicaraguan” satellite tv installers. This is an all legit TV service where you pay a fair monthly fee and you get a great satellite TV service in return. IMPORTANT : With small dish installations like with option (2) or (3) or (4), we DO NOT ask to provide any money up front. We let our product speak for itself. We will visit you, install the satellite service and once it is up and running and you are a happy customer then we proceed to settle the investment part. (1) Dish Network USA (on Big 8ft. Satellite Dish) for approx. USD $2,499. This is the most stable and elegant solution to watch high quality U.S. TV and this where the bulk of the High Definition TV channels are. If you want quality and want to retire with the best, this is the best choice. Keep in mind that you will get two dishes, a small 3 ft. dish pointing to satellite 121° West for the Networks in HD such as ABC, CBS, FOX, NBC and 80+ standard definition TV channels and a big dish pointing to satellite 72.7° West for all of the HD TV Channels. Also, if you buy a DVR receiver, the satellite TV solution will provide all DVR features. (2) DirecTV Puerto Rico (Prepaid) – NO CONTRACT – USD $1,250 (90% All English). (4) Watch all 4 Major U.S. Sports (All Regular Season Games NFL, NBA, NHL, MLB) over Satellite/Small Dish for “USD $20/month”. Very stable. As many TV sets as you want. A USD $700 investment that uses a small dish to get all major U.S. Sports. This solution does not provide the American ESPNs but you can get ABC, FOX and NBC in SD. DirecTV Puerto Rico in Nicaragua. Dish Network with Big Dish. For our wordpress website, visit the following Satellite TV in Nicaragua link.